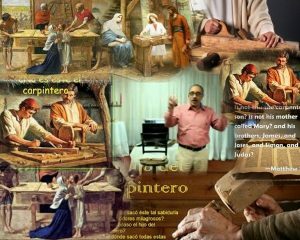 Is not this the carpenter. 1 And he went out from thence, and came into his own country; and his disciples follow him. 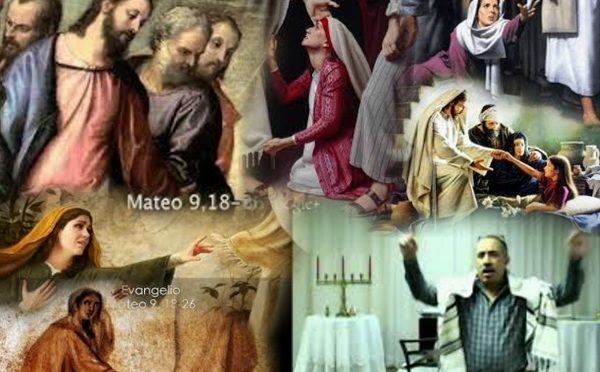 2 And when the sabbath day was come, he began to teach in the synagogue: and many hearing him were astonished, saying, From whence hath this man these things? and what wisdom is this which is given unto him, that even such mighty works are wrought by his hands? 3 Is not this the carpenter, the son of Mary, the brother of James, and Joses, and of Juda, and Simon? and are not his sisters here with us? And they were offended at him. 4 But Jesus said unto them, A prophet is not without honour, but in his own country, and among his own kin, and in his own house. 5 And he could there do no mighty work, save that he laid his hands upon a few sick folk, and healed them. 6 And he marvelled because of their unbelief. And he went round about the villages, teaching. To a virgin espoused to a man whose name was Joseph, of the house of David; and the virgin’s name was Mary. 28 And the angel came in unto her, and said, Hail, thou that art highly favoured, the Lord is with thee: blessed art thou among women. 29 And when she saw him, she was troubled at his saying, and cast in her mind what manner of salutation this should be. 30 And the angel said unto her, Fear not, Mary: for thou hast found favour with God. 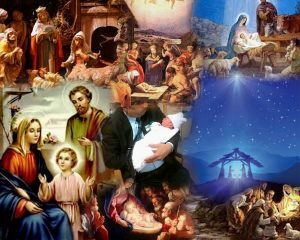 31 And, behold, thou shalt conceive in thy womb, and bring forth a son, and shalt call his name JESUS. 32 He shall be great, and shall be called the Son of the Highest: and the Lord God shall give unto him the throne of his father David: 33 And he shall reign over the house of Jacob for ever; and of his kingdom there shall be no end. 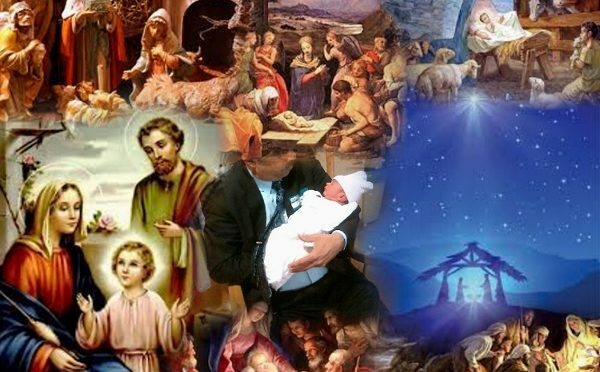 34 Then said Mary unto the angel, How shall this be, seeing I know not a man? 35 And the angel answered and said unto her, The Holy Ghost shall come upon thee, and the power of the Highest shall overshadow thee: therefore also that holy thing which shall be born of thee shall be called the Son of God. 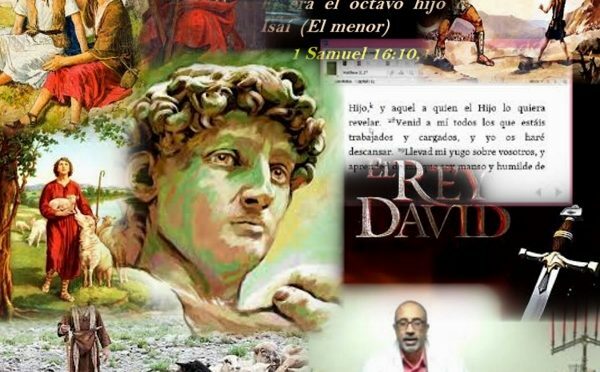 And Nabal answered David’s servants, and said, Who is David? and who is the son of Jesse? there be many servants now a days that break away every man from his master. 11 Shall I then take my bread, and my water, and my flesh that I have killed for my shearers, and give it unto men, whom I know not whence they be? 12 So David’s young men turned their way, and went again, and came and told him all those sayings. 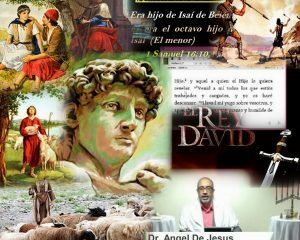 13 And David said unto his men, Gird ye on every man his sword. And they girded on every man his sword; and David also girded on his sword: and there went up after David about four hundred men; and two hundred abode by the stuff. Wherefore Saul returned from pursuing after David, and went against the Philistines: therefore they called that place Sela-hammahlekoth. 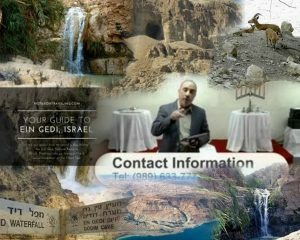 24 And it came to pass, when Saul was returned from following the Philistines, that it was told him, saying, Behold, David is in the wilderness of En-gedi. 2 Then Saul took three thousand chosen men out of all Israel, and went to seek David and his men upon the rocks of the wild goats. 3 And he came to the sheepcotes by the way, where was a cave; and Saul went in to cover his feet: and David and his men remained in the sides of the cave. 4 And the men of David said unto him, Behold the day of which the LORD said unto thee, Behold, I will deliver thine enemy into thine hand, that thou mayest do to him as it shall seem good unto thee. Then David arose, and cut off the skirt of Saul’s robe privily. 5 And it came to pass afterward, that David’s heart smote him, because he had cut off Saul’s skirt. 6 And he said unto his men, The LORD forbid that I should do this thing unto my master, the LORD’s anointed, to stretch forth mine hand against him, seeing he is the anointed of the LORD. 1 Then they told David, saying, Behold, the Philistines fight against Keilah, and they rob the threshingfloors. 2 Therefore David enquired of the LORD, saying, Shall I go and smite these Philistines? And the LORD said unto David, Go, and smite the Philistines, and save Keilah. 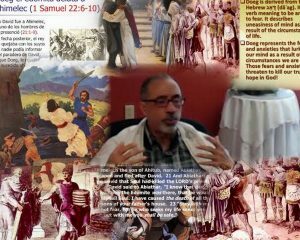 3 And David’s men said unto him, Behold, we be afraid here in Judah: how much more then if we come to Keilah against the armies of the Philistines? 4 Then David enquired of the LORD yet again. And the LORD answered him and said, Arise, go down to Keilah; for I will deliver the Philistines into thine hand. 5 So David and his men went to Keilah, and fought with the Philistines, and brought away their cattle, and smote them with a great slaughter. So David saved the inhabitants of Keilah. 6 And it came to pass, when Abiathar the son of Ahimelech fled to David to Keilah, that he came down with an ephod in his hand. 7 And it was told Saul that David was come to Keilah. And Saul said, God hath delivered him into mine hand; for he is shut in, by entering into a town that hath gates and bars. 8 And Saul called all the people together to war, to go down to Keilah, to besiege David and his men. 9 And David knew that Saul secretly practised mischief against him; and he said to Abiathar the priest, Bring hither the ephod. 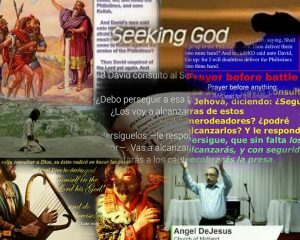 10 Then said David, O LORD God of Israel, thy servant hath certainly heard that Saul seeketh to come to Keilah, to destroy the city for my sake. 11 Will the men of Keilah deliver me up into his hand? will Saul come down, as thy servant hath heard? O LORD God of Israel, I beseech thee, tell thy servant. And the LORD said, He will come down. 12 Then said David, Will the men of Keilah deliver me and my men into the hand of Saul? And the LORD said, They will deliver thee up. Then came David to Nob to Ahimelech the priest: and Ahimelech was afraid at the meeting of David, and said unto him, Why art thou alone, and no man with thee? 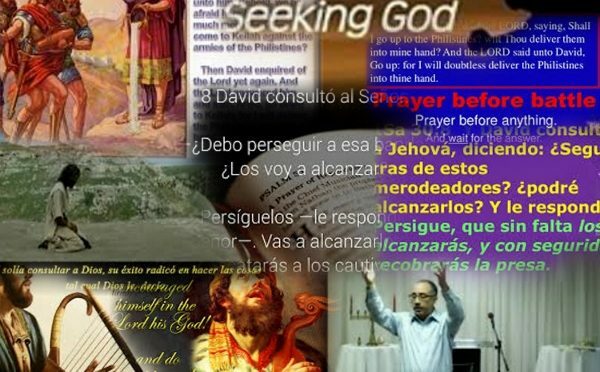 2 And David said unto Ahimelech the priest, The king hath commanded me a business, and hath said unto me, Let no man know any thing of the business whereabout I send thee, and what I have commanded thee: and I have appointed my servants to such and such a place. 3 Now therefore what is under thine hand? give me five loaves of bread in mine hand, or what there is present. 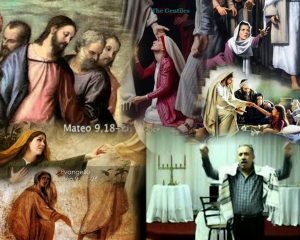 4 And the priest answered David, and said, There is no common bread under mine hand, but there is hallowed bread; if the young men have kept themselves at least from women. 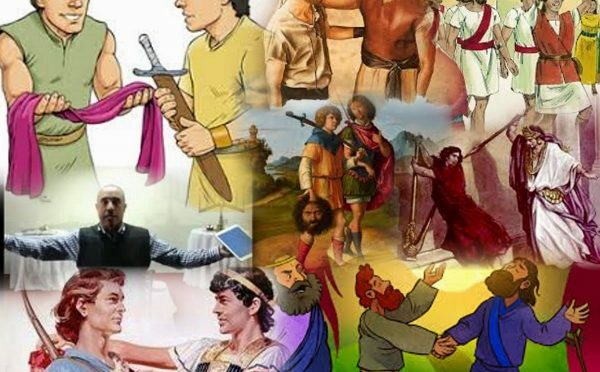 5 And David answered the priest, and said unto him, Of a truth women have been kept from us about these three days, since I came out, and the vessels of the young men are holy, and the bread is in a manner common, yea, though it were sanctified this day in the vessel. 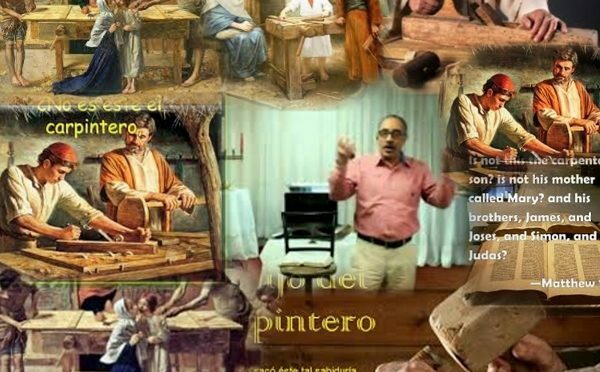 6 So the priest gave him hallowed bread: for there was no bread there but the shewbread, that was taken from before the LORD, to put hot bread in the day when it was taken away. 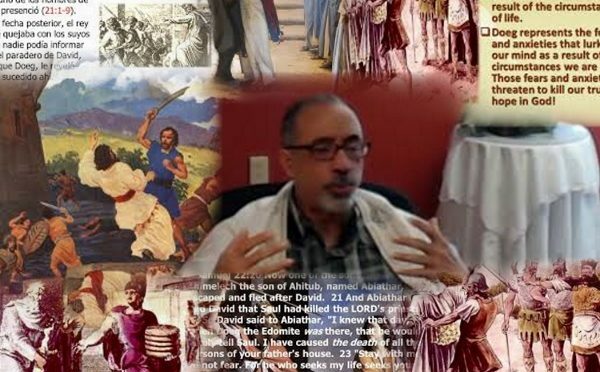 7 Now a certain man of the servants of Saul was there that day, detained before the LORD; and his name was Doeg, an Edomite, the chiefest of the herdmen that belonged to Saul. 8 And David said unto Ahimelech, And is there not here under thine hand spear or sword? for I have neither brought my sword nor my weapons with me, because the king’s business required haste. 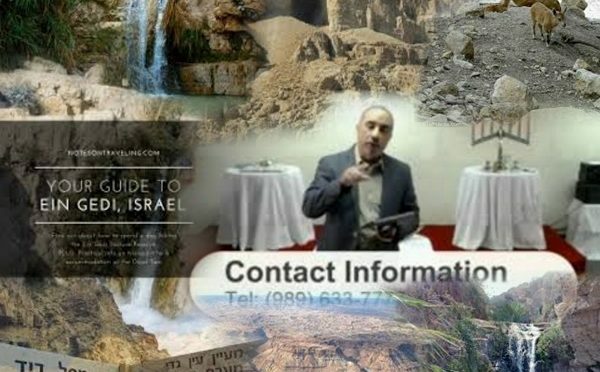 9 And the priest said, The sword of Goliath the Philistine, whom thou slewest in the valley of Elah, behold, it is here wrapped in a cloth behind the ephod: if thou wilt take that, take it: for there is no other save that here. And David said, There is none like that; give it me. And it came to pass, when he had made an end of speaking unto Saul, that the soul of Jonathan was knit with the soul of David, and Jonathan loved him as his own soul. 2 And Saul took him that day, and would let him go no more home to his father’s house. 3 Then Jonathan and David made a covenant, because he loved him as his own soul. 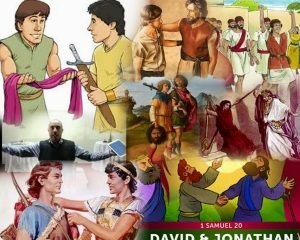 4 And Jonathan stripped himself of the robe that was upon him, and gave it to David, and his garments, even to his sword, and to his bow, and to his girdle. 5 And David went out whithersoever Saul sent him, and behaved himself wisely: and Saul set him over the men of war, and he was accepted in the sight of all the people, and also in the sight of Saul’s servants.